Symptoms begin as a darkened water-soaked appearance to the grass (Plate 1). The patches enlarge and may develop salmon-pink to orange-brown rings of conidia around the outside of the patch (Plate 2). In conducive weather conditions, white, pink or grey mycelia may grow over the patch surface. Where is Microdochium Patch found? Any area of turf, especially golf greens, tees, fairways and bowling greens. 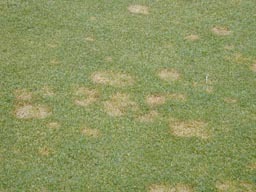 Fusarium Patch is the most common and widespread disease at present in the UK and Ireland. Grass swards dominant in Poa annua, as it is the most susceptible grass species. When is Microdochium Patch likely to attack turf? 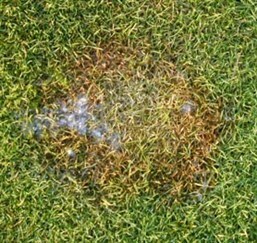 Fusarium Patch can occur at any time of the year during conducive weather conditions. It is most common and damaging during the autumn and winter when the weather is mild and moist. It may also occur during spring in mild temperatures and during summer in warm, humid or thundery conditions. Fusarium Patch can be a devastating disease on fine turf surfaces as the patches may be many inches in diameter and adversely affect the playing surface as well as its aesthetic value. Poa annua grass may ingress into the scars left by Fusarium Patch. Ensuring adequate drainage and manage the turfgrass to reduce surface moisture. Keep thatch layers to a minimum. Light penetration (especially morning sunlight) and airflow should be encouraged to dry the turf surface quickly. Use recommended rates of fertiliser at the recommended timing to prevent lush growth when conditions are conducive to the pathogen. Use acidifying fertiliser such as ammonium sulphate to help reduce the pH at the turf surface. Discourage the ingress of annual meadow-grass. Avoid heavy applications of topdressing in conducive conditions. Apply iron to help harden the plant against infection prior to the onset of conducive conditions. Regularly look at GreenCast to identify periods of high risk. Preventative applications of systemic fungicides will provide longer- term control of Fusarium Patch and ensure optimum playing quality of the turf. Once symptoms have been observed a contact fungicide is required to give good 'knockdown' of the existing disease. During late summer, Heritage Maxx or Heritage should be applied at full rate when GreenCast has predicted medium-high disease risk and the forecast is for further conditions conducive to the spread of Fusarium Patch. In late spring or early autumn, when grass growth is slowing, the fast uptake and action of Banner Maxx and Heritage Maxx may prove more effective. During winter months turf managers should switch to the long-lasting contact activity of Instrata or Medallion, applied every month to six weeks as required. Check GreenCast to determine the risk of infection occurring or spreading to help determine the best timing of any Instrata applications.